Agricultural niversity, Mymensingh , Bangladesh. 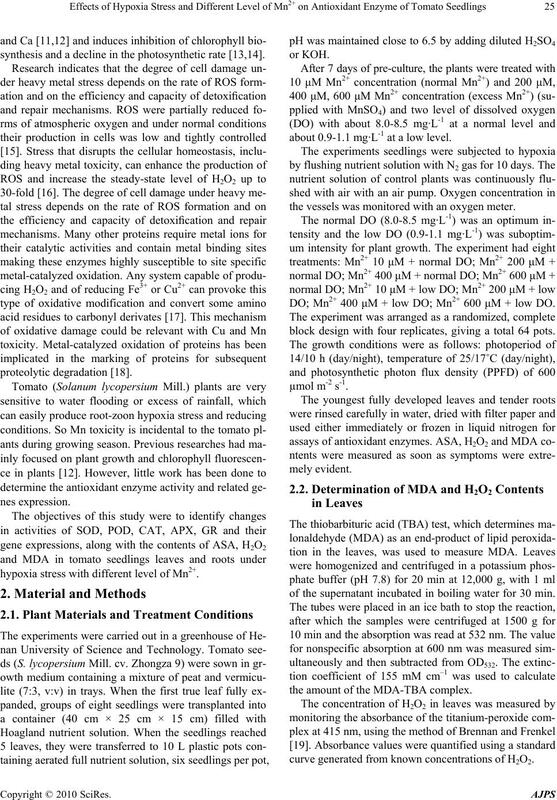 400-600 μmol·L-1 under hypoxia stress, the activities of SOD, POD, APX, GR and ASA content decreased remarkably. allenge which plants have to face throughout their life. less than 2 ml·L-1 . will become much lower around the root-zoon of plants. synthesis and a decline in the photosynthetic rate [13,14]. 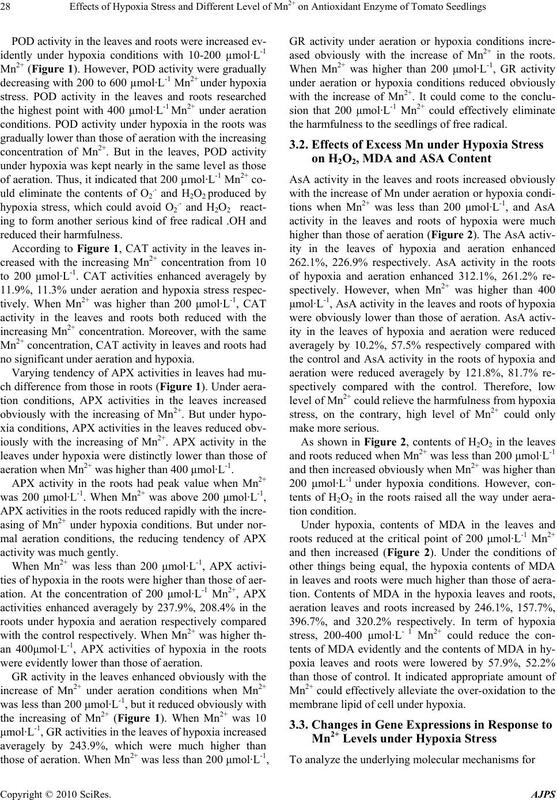 hypoxia stress with different level of Mn2+. about 0.9-1.1 mg·L-1 at a low level. the vessels was monitored with an oxygen meter. DO; Mn2+ 400 μM + low DO; Mn2+ 600 μM + low DO. block design with four replicates, giving a total 64 pots. of the supernatant incubated in boiling water for 30 min. the amount of the MDA-TBA complex. curve generated from known concentrations of H2O2. phosphate buffer (pH 7.0), 10 mM H2O2, and the enzyme. = 39.4 mM cm–1) . in the absorbance of NADPH at 340 nm. tests using Origin Pro 7.5 and SAS software. with RNeasy Mini Kit (Qiagen). re shown in Table 1 and used for amplification. SYBR Green PCR Master Mix (Applied Biosystems). relative to the expression of the housekeeping gene actin. to the control were expressed as 2-∆∆Ct. Table 1. 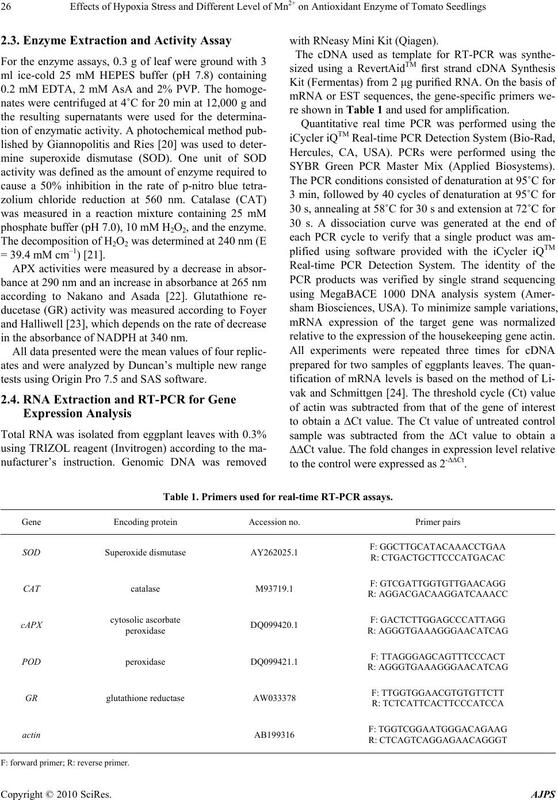 Primers used for real-time RT-PCR assays. the leaves and roots than aeration condition (Figure 1). ferent letter indicates significant difference between treatments (P < 0.05). The same is as below. no significant under aeration and hypoxia. aeration when Mn2+ was higher than 400 μmol·L-1. were evidently lower than those of aeration. ased obviously with the increase of Mn2+ in the roots. the harmfulness to the seedlings of free radical. membrane lipid of cell under hypoxia. Figure 2. 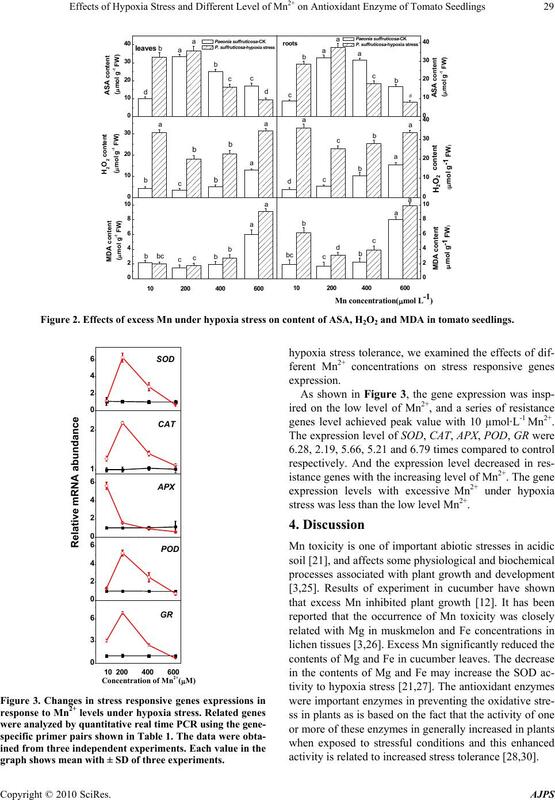 Effects of excess Mn under hypoxia stress on content of ASA, H2O2 and MDA in tomato seedlings. graph shows mean wi th ± SD of thr ee experiments. genes level achieved peak value with 10 µmol·L-1 Mn2+. stress was less than the low level Mn2+. 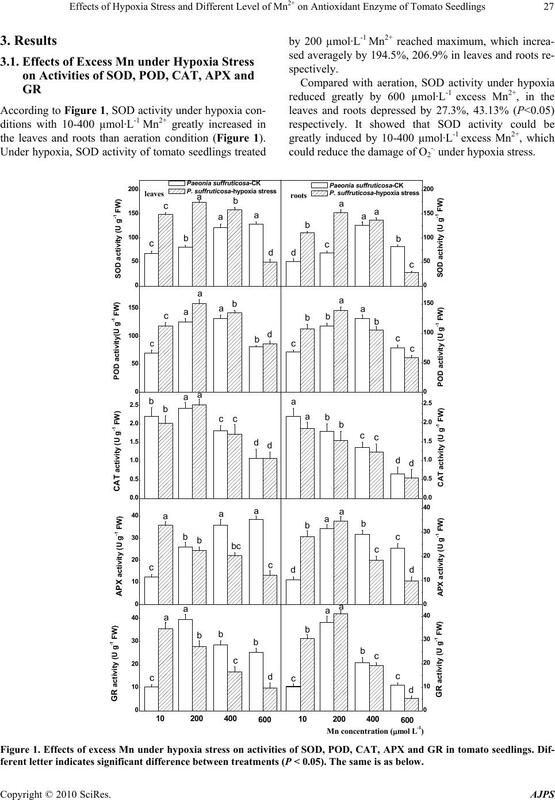 activity is related to increased stress tolerance [28,30]. tection from damage associated with oxidative stress . No. 2, April 1991, pp.117-149. Journal, Vol. 69, No. 1, January 2005, pp. 87-95. 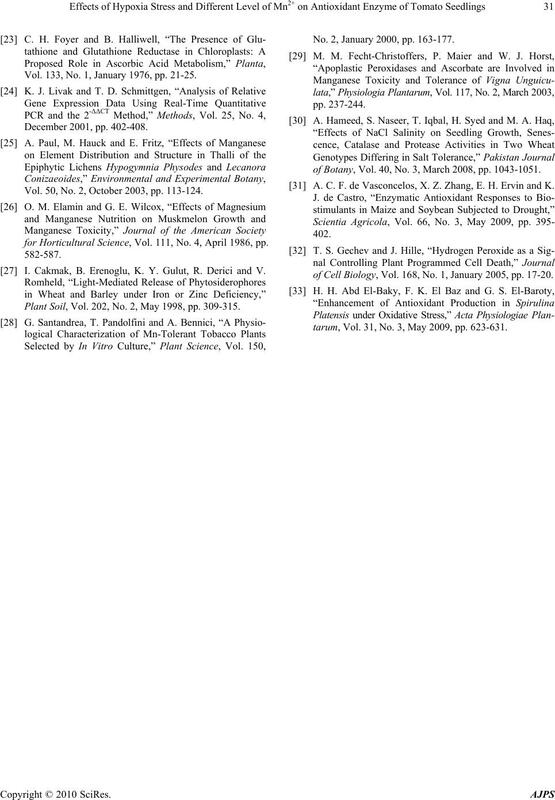 C. O. Dimkpa, D. Merten, A. Svatoš, G. Büchel and E.
Siderophores,” Soil Biology & Biochemistry, Vol. 41, No. 1, January 2009, pp. 154-162. Soil, Vol. 240, No. 2, March 2002, pp. 235-251. Rice,” Plant Science, Vol. 152, No. 1, January 2000, pp. 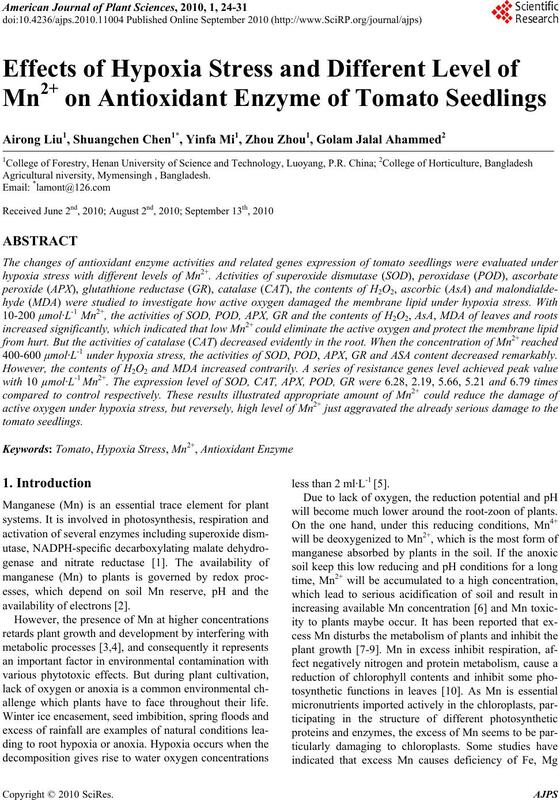 Q. H. Shi, Z. Y. Bao, Z. J. Zhu, Q. S. Ying and Q. Q.
Uptake and Distribution,” Journal of Plant Nutrition, Vol. 13, No. 5, May 1990, pp. 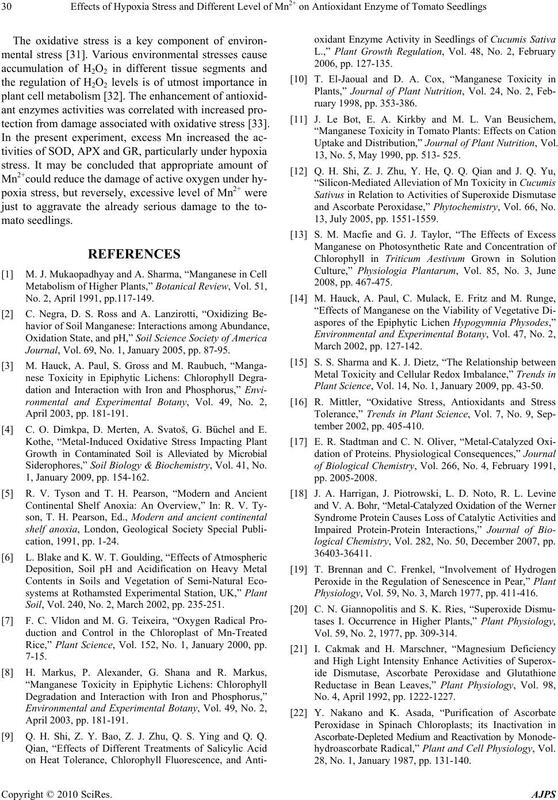 513- 525.
and Ascorbate Peroxidase,” Phytochemistry, Vol. 66, No. 13, July 2005, pp. 1551-1559. Plant Science, Vol. 14, No. 1, January 2009, pp. 43-50.
logical Chemistry, Vol. 282, No. 50, December 2007, pp. Physiology, Vol. 59, No. 3, March 1977, pp. 411-416. Vol. 59, No. 2, 1977, pp. 309-314. No. 4, April 1992, pp. 1222-1227.
hydroascorbate Radical,” Plant and Cell Physiology, Vol. 28, No. 1, January 1987, pp. 131-140. Vol. 133, No. 1, January 1976, pp. 21-25. Vol. 50, No. 2, October 2003, pp. 113-124.
for Horticultural Science, Vol. 111, No. 4, April 1986, pp. I. Cakmak, B. Erenoglu, K. Y. Gulut, R. Derici and V.
Plant Soil, Vol. 202, No. 2, May 1998, pp. 309-315. No. 2, January 2000, pp. 163-177.
of Botany, Vol. 40, No. 3, March 2008, pp. 1043-1051. A. C. F. de Vasconcelos, X. Z. Zhang, E. H. Ervin and K.
of Cell Biology, Vol. 168, No. 1, January 2005, pp. 17-20.
tarum, Vol. 31, No. 3, May 2009, pp. 623-631.